This year our family has something to be thankful for that less than a year ago we would have never imagined it even being a part of our life, much less saying we were thankful for it. But we are. 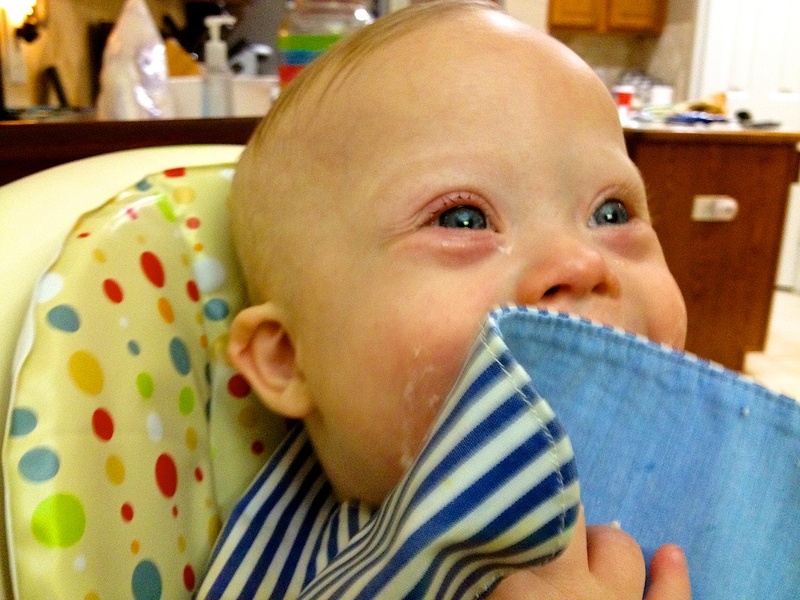 This thanksgiving we’re thankful to have a son with Down syndrome. Our son almost came with an extra, extra bonus…. A few days after our son surprised us by being born with Down syndrome we were called to our pediatrician’s office to discuss something that came back on his newborn screen. This something ended up being the possibility that our son could have Glutaric Acidemia, type 1 (GA-1), in addition to Down syndrome. Noah's first Thanksgiving day parade! I’ll never forget walking in the front door of our apartment after that doctor visit. I was still trying to wrap my mind around the fact that our son was unexpectedly born with Down syndrome just a few days earlier. I was still trying to sort through what that meant for him and for our family. I was still hurt, confused, heavy hearted, and worried about our little baby boy. I mean come on, he was only a few days old, and it takes time for a new parent to sort through all of the emotions of a Down syndrome diagnosis. 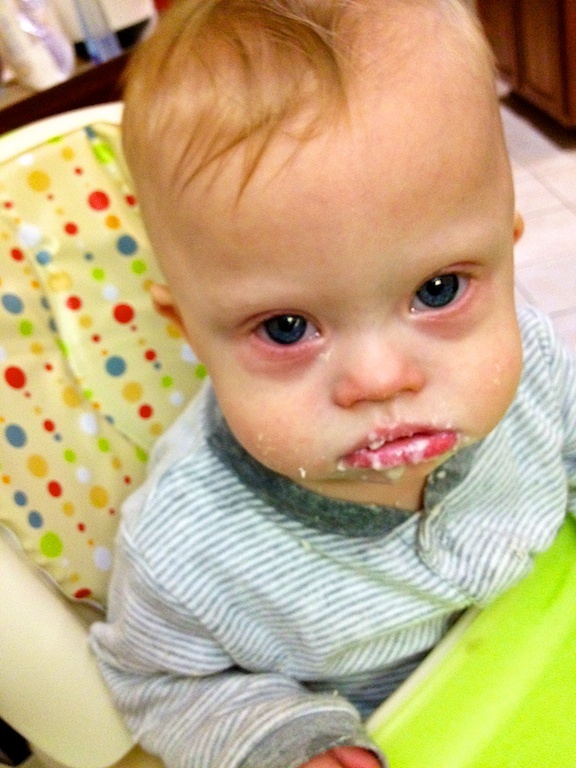 Now not only does my son have Down syndrome, but he may also have a very rare metabolic disorder that could kill him. Wow! Talk about kicking a guy when he’s down. I”m getting teary eyed just reflecting on that day as I draft this post. You can read more about what I call the scariest week of my life if you’d like, but after about a month and a half of testing, which included taking our few weeks old son to a geneticist to have his DNS sequenced, he ended up not having Glutaric Acidemia. Thank God! The 6 weeks that changed my life…forever. Our family has much to be thankful for! When I found out Noah may have GA-1 I had to think about how our life was going to change if Noah had Down syndrome and Glutaric Acidemia, including the possibility of loosing our son. That was a whole different animal. 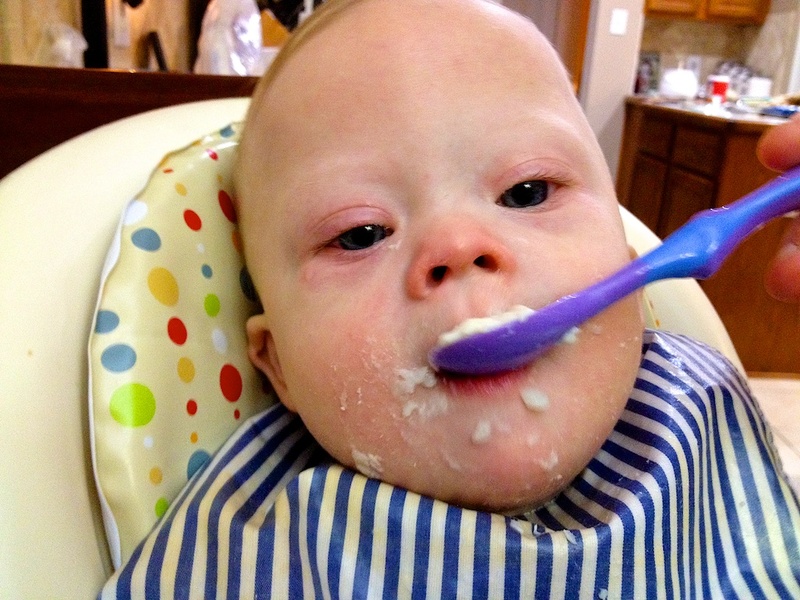 Down syndrome I was ok with, GA-1 (and the reality that our son could die) I was not. I had to have a lot of heart to heart conversations with God during those 6 weeks. 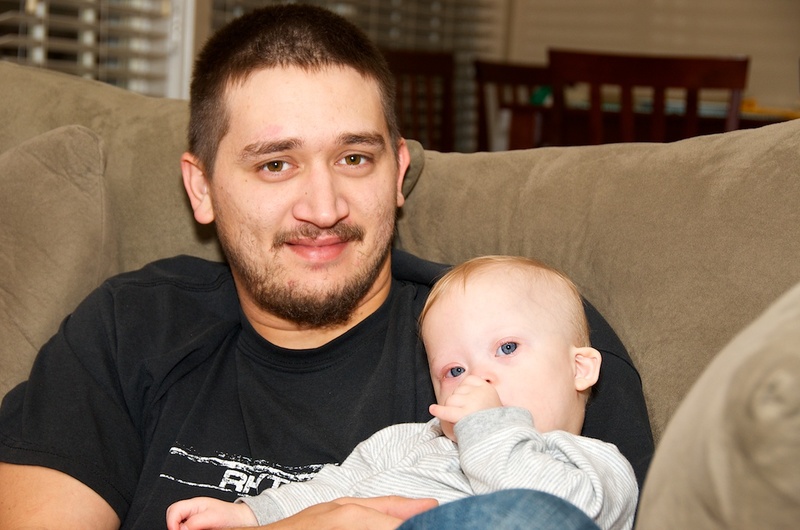 I remember pleading with God that our son would just have Down syndrome. When all the dusted settled (and before we received the results) I came to grips with the fact that our children are not are own. They are God’s. They belong to them. We are their parents, their stewards. One day they will leave us. They get married, they move out, they get a roommate and at some point our children die. Sometimes they die after us, and sometimes, sadly, they die before us. I say that not to be morbid, but just to remind you (and me) that our children aren’t forever. We never know what any day may hold. Our children (and us) are only one Doctor’s appointment away from having their lives changed forever. You can either allow fear to paralyze you and keep you from enjoying the joy of today, or you can move forward choosing to trust that God truly does have the whole world in His hands, including you and your family. It doesn’t mean that what your facing isn’t scary. But it does means coming to a very real place in your life where you truly trust that God is bigger than your fear, and He is able to see you through it. Your fear doesn’t control you. When fear comes knocking at your family’s door you tell it to go somewhere else, because fear doesn’t win in your house, God does. 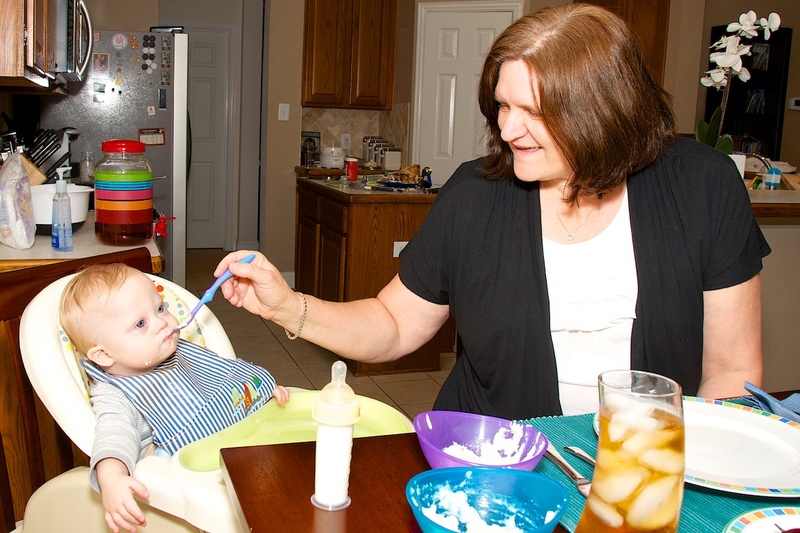 Noah's grandmother feeding him his first Thanksgiving meal. All of that to say that on the other side of that 6 week waiting period, I came out a different person. God used those 6 weeks to help me deal with my fear and anxiety issues. (Yes, my name’s Rick Smith and I’m worrier!) 🙂 He wanted to show me that He is able to give us joy even in one of the scariest moments of our life. Up until that point in my life I had only heard stories about God giving people this kind of joy, but now I know first hand those stories are true. God really can meet our needs when nothing else on this planet can. How amazing is that! So on this thanksgiving (our son’s first) I am extremely thankful that I’m not faced with the reality of raising a child born with Down syndrome and GA-1. Don’t get me wrong, our God is a big God. If Noah would have had GA-1, He would have certainly enabled us to get through it. However I’m speaking honest and from my heart when I say I am thankful that we don’t have to go down that road. If you ended up on this page somehow because your child is facing the possibility of a GA-1 diagnosis I’m sure I’ve only added to your fear. But I want you to know that I’m speaking to you from the heart, and yes as a parent that is scary, very scary. Your child really can die as a result of it. That’s perhaps one of the scariest things I can think of. Now let me try to give you some encouragement. Now this is one happy (and full) baby! First, there are a lot of false positives on the newborn screen. and it’s very likely that will be the case with your child. If that’s not the case, GA-1 is like most everything medically related in that there is a wide range of how it affects a person. 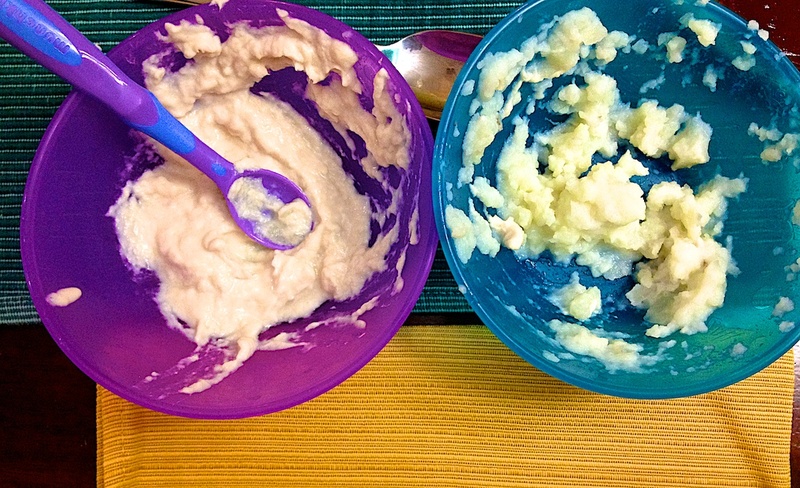 Your medical team will help you develop a plan for your child that helps keep them from having a metabolic crisis. Furthermore, as stressful as newborn screens (and false positives) can be, it’s all worth it if it helps just one child catch a genetic condition as early as possible. This is his "I'm getting stuffed" face...! As with almost everything medically related, the earlier a person is diagnosed with a condition, the better. I tell you all of this in an attempt to encourage you. I’m sure you are very scared, but know that we live in a time like no other time in history, and our medical community has become very good at helping children with all sorts of conditions (including GA-1) live long and healthy lives. As I’ve mentioned we have a lot to be thankful for this Thanksgiving. I can honestly say that I’m thankful to be the parent of a child with Down syndrome. This child has changed our family’s life in more ways than I could even begin count. I’m thankful that my son is healthy. That he is growing, learning, and developing. I’m thankful for how joyous and fun this little boy is. It’s awesome being his daddy. Will there be bumps in the road? Sure. Will there be lots of scary times in our future? Sure, what child doesn’t scare his parents from time to time? But for today, for this first Thanksgiving with our new little baby boy, things are ok. The rush of emotions we dealt with the few months of Noah’s birth has subsided. I don’t freak out as much every time we have to take Noah to see his pediatrician (although waiting for the results every time Noah gets a CBC still causes my heart to beat faster than normal.) I don’t get (as) worried every time Noah gets a little cough. Other than Noah having a little virus (as you can see in some of the pictures) today is a great day of enjoying life, eating lots of yummy food (thanks Abbie!) 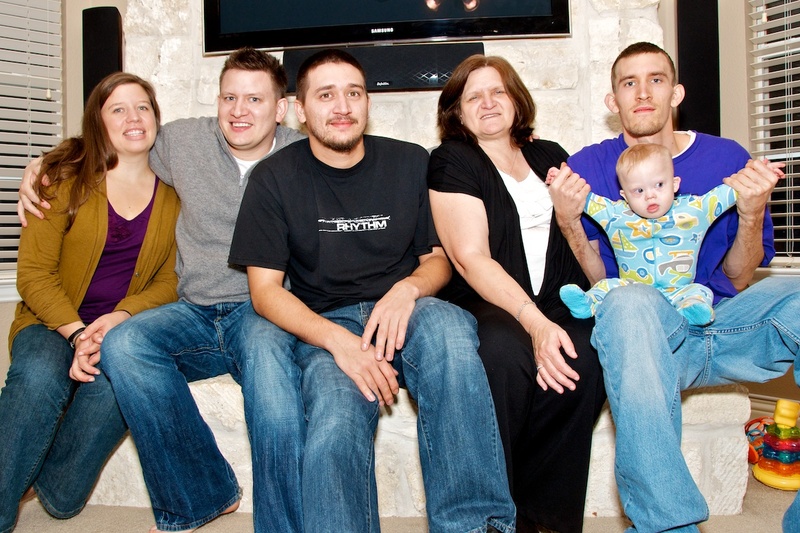 and enjoying time with family…and being very, very thankful that my son just has Down syndrome! I'm so in love, and thankful, for this family! I know it’s not Thanksgiving right now, but it’s always good to reflect on things you’re thankful for. So please take a second to leave a comment below and let me know one or two things that your especially thankful for right now. Thanks for sharing your story with us. You guys sound like great parents! I’m sorry to hear about your husbands side of the family cutting you off. It sounds like you have a great group of friends and other family supporting you, that’s great! How old is your son now, and how old are your other children? Elias is now nearly 3 months and he is adored by Isaac who is 5 and Keila who is about to turn 3. Actually it was my parent who cut us off the moment we were engaged. The Lord works in mysterious ways though. We kept a family blog (an iinformal way to allowing them to choose when they wanted to know what was up with us anonymously) and worked on forgiving. Over the last 10 years little things occured to enable us to see each other at my brother’s wedding. They wanted minimal contact with us and our kids but when they heard Elias was born with DS they were devastated and worried for us. (love shows in funny ways…) and have since initiated contact through skype in the last 4 weeks. I think Elias is our bridge and an answer to our prayer. Wow, that is very cool indeed how God used circumstances in your life to help bring your family closer. 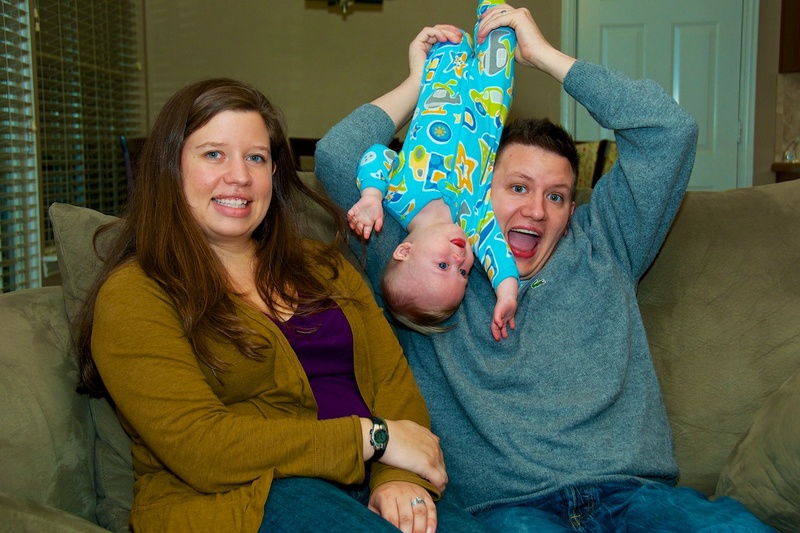 We’ve found that our son has done the same thing in our family. It’s been great. Just a bit of info. Mead-Johnson makes all kinds of specialized formulas for babies & children with metabolic dissorders. When I couldn’t find a previously available lactose free toddler formula for my youngest they shipped a 1 year supply free. While we haven’t had the scare you had, I have met so many children with so many conditions worse than Down syndrome and so many with Down syndrome who have complications that we don’t face with our Wesley, 3 yrs old. I have seen in my life and in others’ lives how that God’s grace is sufficient whether the problem we face is big or small. Some things specifically that I’m thankful for (and some of these are piddly): no need for hearing aides or glasses, being able to wear foot supports that fit inside normal shoes instead of something visible, no heart surgery, no intestinal issues. Some things we need grace for right now: changing schools in the fall, possible speech apraxia. God is good. Thank you for the reminder! I’m glad to hear things are going well for Wesley. I always am hesitant to write posts like this because the last thing I ever want anyone to do is feel worse if their child isn’t doing well. I also know that at any moment things could take a turn for the worse for Noah, myself, my wife or anyone else, which keeps me very humble. My heart breaks for children and families going through hard times, and I pray for so many of the families I’m able to connect through our site. But think it’s ok to speak from the heart as a parent and say I’m thankful for how well my child is doing. Thank you for sharing how your child is doing! I can definitely relate to this. Little Man was a week old when we got the call from the pediatrician’s office that there might be something wrong with his newborn screening. A lot of tests happened over the next few days and weeks and when Little Man was about three and a half months old, we had our definitive answer: Little Man was born with a rare metabolic disorder, acronymed VLCAD. It, too, was something that could kill him…..but it’s totally manageable. Now he’s 19 months old and things are fine. He’s pretty much “normal” except when he gets sick…then we have to visit the hospital and we have to put the metabolic doctor on alert. It’s not fun. As long as he takes care of himself, he can live a long, and relatively normal life. But I can remember what I went through after that first phone call and your story relates so much (minus the religion part – we’re not overly religious in our house). Thanks for sharing. There is no fear like the fear of something happening to your child and you not having the power to do anything about it, huh? I’m so glad to hear that your son is doing well now! By the way, do you guys have any other children? Today I’m thankful for the excellent information and contacts we were given when Daniel was born. He turned 3 months on Monday and we’re already done our Early Intervention evaluation plus two visits with the occupational therapist. Plus we’re scheduled to go to the Sie Center (a Down syndrome specific clinic associated with Children’s Hospital in Denver) next week and meet with a team of doctors and talk to a geneticist. I never would have managed all that without people pointing us in the right direction! Wow…rolling over for the first time…!!! That’s a huge milestone indeed! Congrats! You guys must be so proud. We’re proud as well. Thanks for sharing that with us. Rick, I can totally relate to your feelings and thankfulness. At week 15 of my pregnancy, the nuchal translucency test showed a 1in 5 chance of our Leo having Trisomy 13 or 18, both of which are fatal either during the pregnancy or soon after birth. Trisomy 21 was far from our minds since the test showed little additional risk. We showed up for an amnio to basically find out if our baby would survive! Needless to say, the positive result for trisomy 21 was a shock. But at least it was the good news we had prayed for! I never imagined in the midst of my shock, fear and sadness, that someday I would be happy Down Syndrome is all that Leo has. Like you, I am thankful!! It sounds like you know JUST how I feel. 🙂 I’m so glad that Leo is doing well. How old is he now by the way, and do you guys have any other children? I am thankful for your for your post. I am a big worrier about everything and even though my boys 2 1/2 and 6 1/2 are healthy for the most part, your post is a reminder to let go of some of my anxiety and worry and let God. Thank you. I sounds like you’re a great mom doing a great job, keep it up! Does one of your children have Down syndrome? 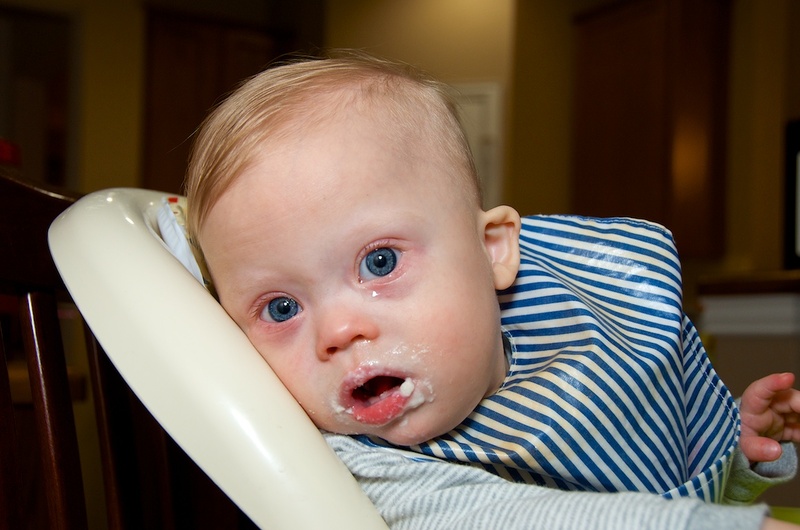 No, neither has Down’s Syndrome, but the youngest was hospitalized a couple of times when he was younger for pyloric stenosis, a neck abscess, and severe RSV. Both are facing growth issues and we have a long-awaited appointment with a pediatric endocrinologist in July. I enjoy your blog; Noah is lucky to have you for a Dad! I dropped by your site via the WP.org support forum to see how I could help you with the TC widget, and instead was excited to read your amazing blog! Noah is SOOOOOO ADORABLE, I just want to squish his chubby chubby cheek and kiss his perfect round eyesssss! Yeah. I know the feeling. I thank God every day that my Edry only has Down Syndrome too. He’s just so healthy and is the life of the household right now. His big bro especially spoils him to pieces and Edry can’t get enough of it! OK, let me get back to looking at your HTML codes and see what I can do…. My daughter Jovie has just been diagnosed with Rett Syndrome. We’d suspected it for over a year, and finally the DNA results came in last week. If I’m honest, I had hoped her Autism & Developmental Delay diagnosis was it – because this whole Rett Syndrome world is scary HOWEVER I am grateful we live in a world where I can email another Rett mum and she is there. I am grateful for science for giving us this information about our children. And I am grateful for my children for teaching me about this world. Thanks for sharing that with us. I’m sorry about the Rett Syndrome diagnosis, but like you said, this is a time like no other in history. We can connect with our people that’s “where we are” any time, online. How old is Jovie? Do you guys have any other children? Jovie just turned 3 🙂 And we have a beautiful son Jasper who is 4 – busy times! I wanted to say that I hear you. Once you are faced with the mortality of your child it really puts everything else into perspective. Hearing “Down Syndrome” was hard, I’ll admit. But 4 hours after that, hearing “Heart defect requiring open heart surgery” just didn’t compare. Otto is now 7 months old. I honestly never ever thought we’d get here. He came through surgery, and I thank God for that. We had 860 people attend a Facebook prayer event for the little guy. Represented were all continents (excluding Antarctica, selfish little penguins). God wanted us to have this baby (a surprise) and He wanted us to rely on Him during those trying times. I am glad they are all over. But really, once you hand your baby over to a stranger and you may not see your baby again nothing else can compare to holding him in your arms again. So I’m with you…thank God its ‘just’ Down Syndrome! Also what’s Otto up to these days? Ruth, thank you for leaving your comment. You have no idea how much we enjoy reading all of these stories that everyone shares with us, so thank you! And 6 boys, wow…! My mother had 4, and we were way more than a hand full! 🙂 I bet you guys have a lot of fun in your house. I just wanted to say that your website has really helped me realize that having a baby with DS isn’t the end of the world. My son was born with DS April 27, 2012 & he has totally & undoubtedly changed our lives for the better. He is such a bright light in our world. We love the lil guy so much & our whole family has been so supportive & loving towards him. He is our only boy. He has 4 older sisters who absolutely love & adore him. We thank God for him everyday. We can’t imagine life without him. Thank you for your awesome website! Congrats on your baby!!!!! One of our goals is to bring encouragement to new families and show them that life is actually pretty awesome 🙂 I am glad that you are discovering that :):) have you seen our Facebook page, there are a lot of families on there sharing their lives and pictures 🙂 do you have a support group in your area?